While the Ritz was once reserved for royalty and dignitaries, today anyone who can pay the price is welcome. No proof of royal bloodline is needed. Art and history come together vividly at the Hotel Ritz Madrid by Belmond. The look and feel of the hotel have been carefully preserved to give the guest an historic experience. While the carpets have all been replaced over the last 100 years, they are custom woven in the original Cesar Ritz designs. 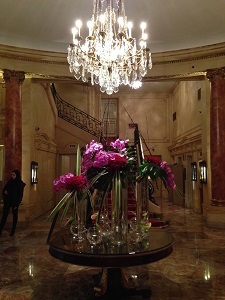 Many of the chandeliers, furniture, and décor are original. Marble bathrooms with gold-plated fixtures are the standard. Fragrant fresh floral displays are living works of art on their own merit, and remind the guest this experience is not just a dream. Although the hotel feels like a great museum, modern amenities such as Wi-Fi, organic bath products, and even green juice on the breakfast buffet are indicative of the hotel’s desire to meet the needs of the modern traveler. The Ritz is all about luxury and service, so the value conscious traveler might quickly reject the idea of booking a room. However, if art, culture, and history pique your interest, consider a night or two in an off-peak season, like late summer when Spaniards make a mass exodus from the city. Or perhaps a Sunday night when there are no wedding parties or conference groups booked. A visit to www.ritzmadrid.es will show special offers, with last-minute rooms sometimes available for about $275 per night. Many packages bundle extra amenities, such as meals or museum and theater tickets. Consider balancing the cost of a night or two at the Ritz with many opportunities for free activities surrounding the hotel. The Ritz is a short stroll to Parque del Retiro, Plaza Mayor, and the Reina Sofia, and just across the street from the Museo del Prado. Museo del Prado, at Calle Ruiz de Alarcon 23, is free from 6 until 8 p.m. Monday through Saturday, and 5 until 8 p.m. on Sunday (www.museodelprado.es). The Reina Sofia, 52 Santa Isabel Street, is free on Monday and Wednesday through Saturday from 7 until 9 p.m. and Sunday from 1:30 until 7:00 p.m. (www.museoreinasofia.es). A stroll through Parque del Retiro can last 30 minutes or all day, and is always free. Street musicians and entertainers in the park provide first class entertainment without the purchase of a ticket, although a tip is always appreciated. 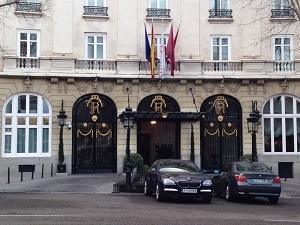 So, if the hotel price is more than a value traveler would typically spend, a two to three day adventure, all expenses considered, makes a visit to the Hotel Ritz Madrid an experience worthy of the splurge. Value travel is not always about taking the cheapest journey. The best reason for being a frugal traveler is so that when the unique and memorable opportunities in life present themselves, one can indulge. 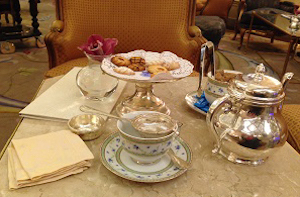 A visit to the Hotel Ritz Madrid is one of those opportunities worth the indulgence.